I found this extraordinary. For, only moments ago, everyone saw how this Somalia-born British Olympic hero was inspiring people of all ages to run alongside him in the Dubai Fitness Challenge at the Palm Jumeirah. And yet, the four-time Olympic champion needed a push from his wife to reach the finish line when confronted by my queries on his dream journey from Mogadishu to the pantheon of iconic Olympians. 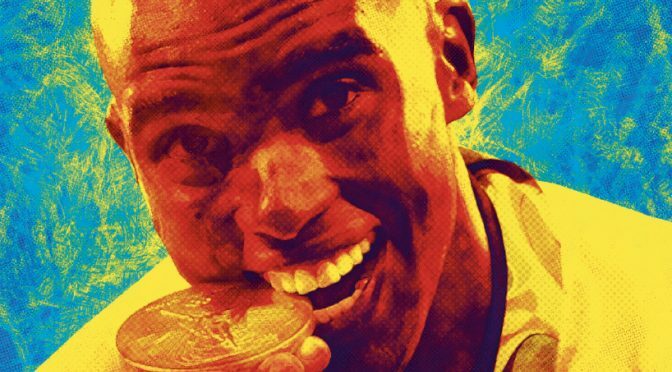 From fleeing strife-torn Somalia with his family at the age of eight to taking baby steps as an athlete in Britain, his adopted home, before becoming the most decorated British athlete of all time, Farah’s has been a remarkable journey – one that has even earned him a knighthood. Only the second man in history to have defended the 5,000m and 10,000m gold medals – both at the Olympics and the World Championships, Sir Mo Farah’s feats in the lung-busting races have now become part of folklore. But more than his 10 gold medals at the highest level (four at the Olympics and six at the World Championships in the 5,000m and 10,000m), Farah revealed what would give him the greatest joy once he finally decides to hang up his boots. “I want people to remember me as who I was. Not what I have achieved on the track. I want them to remember me as a good human being,” he tells me with his wife — Tania — by his side. “But, you know, who could have thought that the boy who couldn’t speak a word of English when he came to the UK at the age of 8, would become a four-time Olympic champion, have four beautiful kids and a beautiful family. He then looked at his wife — Tania — again. “Wasn’t that special for us, Tania?” he asked the woman who would take on the world for him. She even brought an airline worker to her knees for being rude to Farah who happened to be the only “black person in the queue”! This happened in an American airport days after her husband’s stirring run in the 10,000 metres became the story of the 2016 Rio Olympics. Farah fell on the track during the 10th lap of the 10,000m race only to get back on his feet to script the most stunning victory of his glorious career. A year later, there were no false steps as he accompanied the woman he knew from his school days to the Buckingham Palace. “Yes, it was just as much a surreal experience for me,” Tania smiled at her husband. But when Farah quit the track to start a new career in marathon last year, many felt he was too old to realise his dream of making a smooth transition to road racing. The 35-year-old, though, had the last laugh in Chicago when he won his first marathon with a highly impressive time of two hours and five minutes. “It’s a human trend. You will always get people who will have doubts about you. They will question you. But when you put in the work and commit to the cause, anything is possible,” he says. The result has now made Farah dream of a medal in marathon at the 2020 Olympics. That brought me back to the question that has teased my senses since my childhood days. How does Africa keep producing champions in long distance races? “There is no secret,” he says. “It’s about training in high altitude, 10,000 feet, 8,000 feet. It’s the lifestyle, when you live up in the mountains, if you run in those conditions, it makes you very tough. That’s why so many top runners have emerged from east Africa,” he said as he looked at his wife again. Tania then shared with me what she learned about African athletes after working extensively with her husband to help people in some of the continent’s poorest regions. “My impression, having spent time in Africa, I personally think it’s the lifestyle, the upbringing, the conditioning that you get as a kid,” she said. “The Africans have literally nothing, most of them. And lot of people are good at running in Africa. So to be the best out there, they have to be the best in the world to get into their own team! “The people there are so tough, they are so resilient and they work so damn hard. I don’t think there is any other secret other than the tough conditioning,” said the mother of four who fell to the ground after completing the 2016 Great North Run. On that sunny September day in South Shields, England, Farah helped her to her feet. And on a beautiful November evening at the Palm Jumeirah, he was riding the wave of her support.